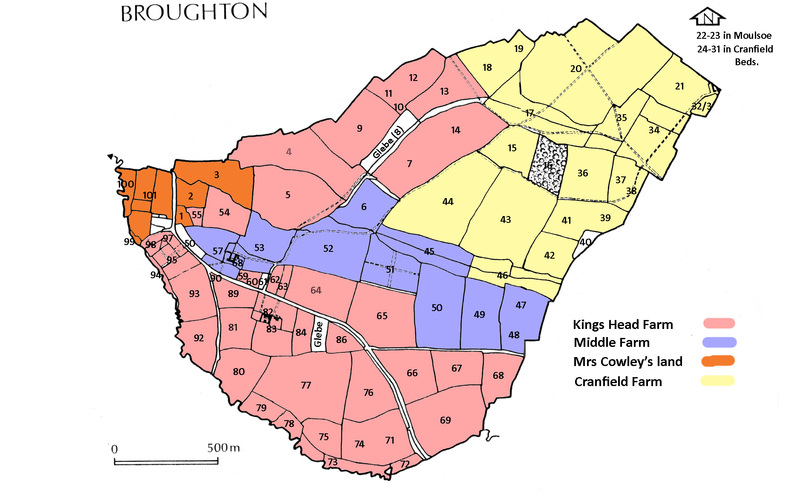 Unfortunately, the 1837 survey transcribed below does not record the names of the tenants holding the farms, but from the study of census returns and other documents it is likely that John Howe held the biggest, Kings Head Farm, Matthew Bliss was at Cranfield Farm and Fanny Butfield held Middle Farm. Mrs Cowley was Ann Cowley, widow of Edward Cowley who had died in 1835. The Cowley family held Brook Farm in the 1779 survey, and Mrs Cowley’s land was what remained of Manor and Brook Farms. The house at Kings Head Farm was later established further south along the main road in fields 82 and 83 and later still renamed Manor Farm. The house at Middle Farm was rebuilt as a ‘model’ farm in the late nineteenth century and became Brooklands Farm giving its name to the area now known as Brooklands. Survey carried out for William Backwell Praed following his inheritance of the Broughton estate.